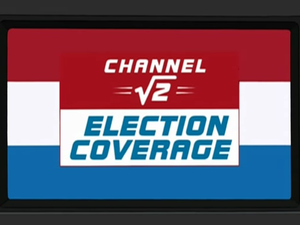 Channel √2 News (pronounced "Channel Root 2 News") is a news show broadcast from New New York on Channel √2. The anchors are Morbo and Linda who have very different personalities. They cover the top stories and interview people such as Richard Nixon's head. The possible destruction of New New York by the garbage ball (1ACV08). The collapse of a mine on Saturn's moon, Titan (2ACV03). Mom taking over Earth (2ACV14). The oil spill on Pluto (3ACV05). Alien poaching of humans for their human horns (4ACV17). Yivo's gentacles coming out of the Anomaly (TBwaBB). The safe return of a talking horse to the meat department (BG). The rising Dark Matter prices (BG). The legalization of Robosexual marriage by the Proposition ∞ (6ACV04). Emperor Nikolai's visit to New New York (6ACV10). The fourth Omicronian invasion of Earth (7ACV16). The trapping and rescue of the helium miners (7ACV18). Business consultant Dan McMasters' homicide (7ACV24). Although Linda said once that they broadcast from Los Angeles (1ACV08), they were later seen in New New York on multiple occasions (2ACV14, 6ACV24) and even referred New New York as "our city" (6ACV04). Either it was a goof in "A Big Piece of Garbage" or they moved to New New York after the episode. In "Lrrreconcilable Ndndifferences", a Channel √2 van is seen in an episode of The Scary Door. Beside it, a Channel 4√4 van is seen as well. It is not known whether this channel appears in reality or only in the Scary Door series. This page was last edited on 22 December 2014, at 20:42.